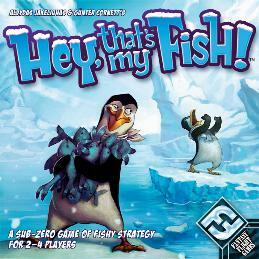 Basic Strategy for Hey, That's My Fish! It’s a very deep game then what it appears on the surface. You can teach kids the difference between short-term – “gobble them up strategy” vs. the longer term of position and out maneuvering your opponents. Don’t be a sucker and think this game is just about who can gobble up the most 3-fish hexes. When you position yourself, try to avoid the edges and corners. In fact, it is way more about position and maneuvering. Try to box in your opponents on small ice sheets and leave the bulk for yourself.